We picked up this pot of pink hyacinths at the supermarket, discounted after Easter. The perfume has been divine. As they started to fade, I knew that I had to shoot them quickly, and pulling one out of the dirt to lay on it's side was just something a little different. Because I don't want to be too predictable, right? I'm happy to report that it is finally looking like spring here in New Jersey. Hooray! The forsythia are blooming their hearts out, and soon the flowers and trees will tumble one over the other in their exuberance. Gorgeous photos! 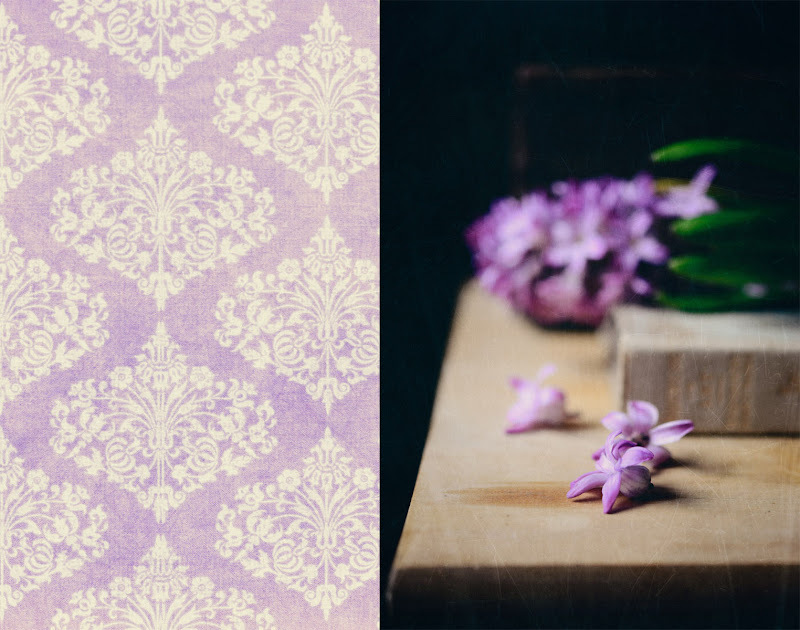 Hyacinths are my pick in this week post on Mosaic Monday. Have a great week. Thanks for hosting this wonderful event. They look like a pretty shade of lavender! Beautiful photos! Happy Monday! Save a little spring for us! It's a long time coming this year for some reason. 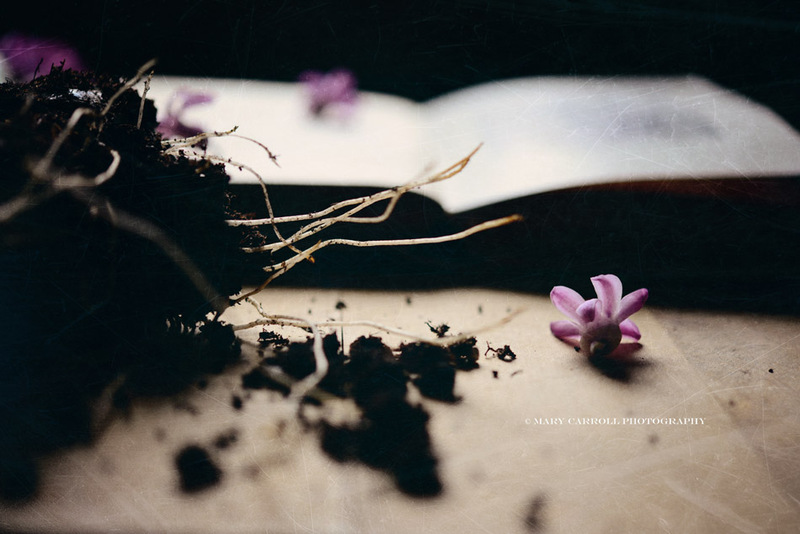 You've displayed the flower,watch, pearls and book in imaginative ways. Love the pink hyacinths. I bet they smell delightful too! 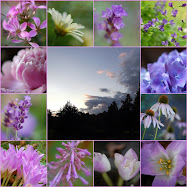 Beautiful collages with your mauves and pale purples in your vignettes. Enjoyed them. Thank you for hosting. Yesterday I took some sky pictures just because I read your sky post. Spring has to be my favorite season. I love when everything is in bloom. Your flowers are beautiful and I love how you staged these. The papers make you feel as if they are the papers inside the book. Beautiful. Lovely images, Mary! You are creative with your vignettes. 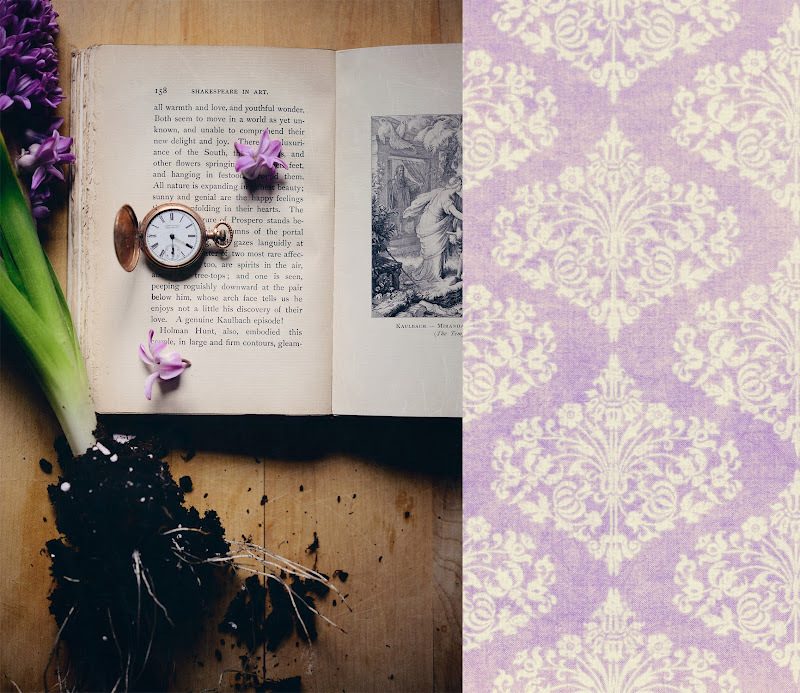 The Purple Hyacinths are beautiful. Thanks for hosting and I wish you a happy week ahead. Thanks for hosting! My flower this week is purple hyacinths!! As to the real world : OH hyacinths....there is no scent to compare!! My favorite. 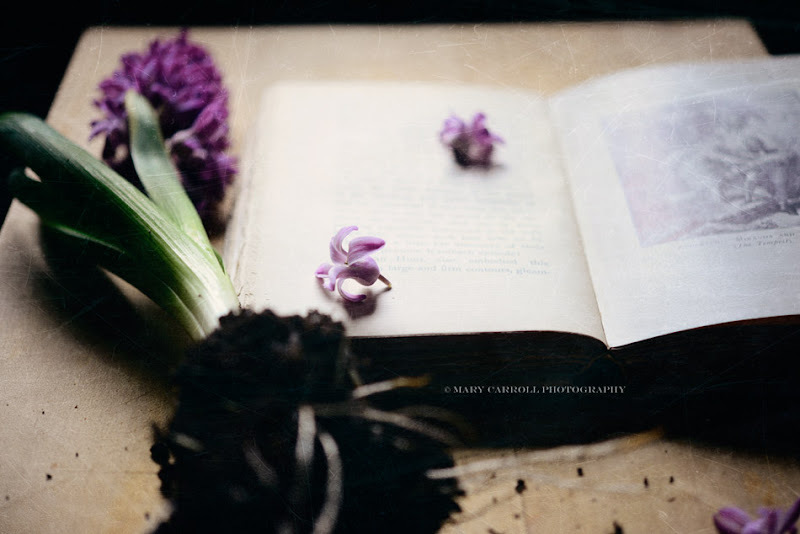 I often think that heaven must smell like hyacinths. Oh, you're so kind, Debra! Thank you! Lovely picks Mary! We continue to have cool temps here with no flowers in sight! Have a good week. Thank you for hosting MM. I LOVE your photo composition in this post, Mary!! Your hyacinths are beautiful, and I'm sure they smell divine. Thank you very much for hosting and have a wonderful week! certainly a different take on things showing the dirt - but it works - such a contrast to the delicate flowers and the pearls. I know there is going to be lots more flower images coming up - and why not - spring is a time of celebration. Enjoy! Have a wonderful week and thank you for hosting Mosaic Monday once again. Lovely photos and composition! Spring has finally arrived in London too, my forsythia and hyacinths are also flowering - about time! Thanks for hosting this lovely meme, have a wonderful week. Take care, Helene. I can smell the beauty just by looking at your photos. Simply wonderful. Thanks for hosting! Pretty post Mary and thank you for hosting. You have a great eye. Beautiful pics. I'm so glad that spring has arrived out your way. The forsythia blooms are such a welcome sight, heralding more and more blooms to come. 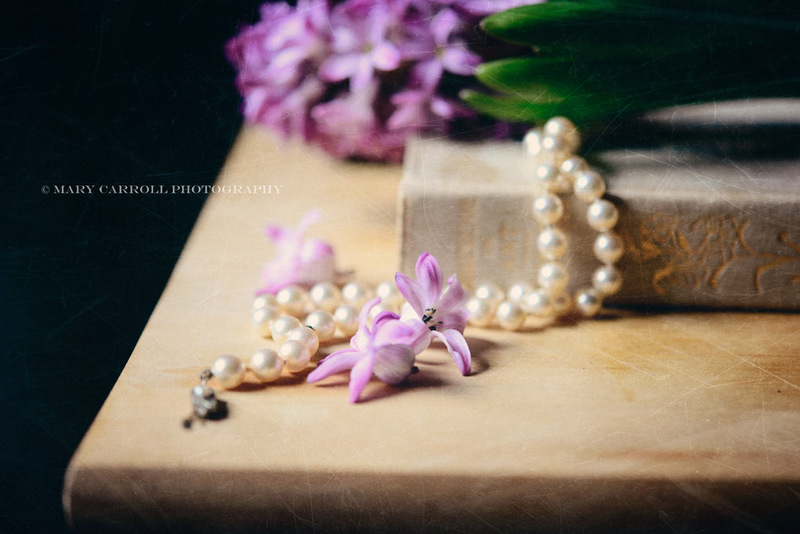 I love your hyacinth compositions - you do such lovely work, Mary. An appropriate book title, too - Shakespeare in Art. Gorgeous photos, Mary! I love the softness of each photo and the composition. We have had spring weather all week but may get some snow showers on Tuesday. April is Colorado's third snowiest month! Wonderful photos ful of atmosphere! As always, beautiful and unexpected compositions. Love the way you use both living plants and old objects in your photography--so fitting for mosaic. I love love love the composition and flowers. Great shots. Yay I made my first mosaic and entered it! What fun! Now I want to make mosaics for all my groups of photos! LOL Thanks for the Tutorial too! How inspiring your set of photographs are today.. I've carefully studied each one, so next time I'm clicking away I will try to be more focused, thinking more about the end result. I'm always in such a rush trying to do a million things at once and it's not working!!! Thank you for another MM party Mary. I can just imagine how lovely the perfume is! I'm late again - just under the wire to be a real Monday contribution! Bellissime foto da cui trarre ispirazione. Mary, I can smell them now! Spring doesn't look the same here as it does there but the geese and ducks have returned. We still have snow, which is melting slowly and before we know it the tulips and daffodils will be surfacing from their long winter nap. I too am so excited for spring!